That’s 7.74 million more than 2014. PRELIMINARY FIGURES FROM the National Transport Authority show that Irish people took over 7.7 million more public transport journeys last year. In total, there were 224.1 million journeys on Dublin Bus, Bus Éireann, Irish Rail and Luas in 2015. There were increases on all networks, with Dublin Bus adding over three million extra passengers, Bus Éireann adding 500,000, Irish Rail adding two million and Luas adding 1.99 million. 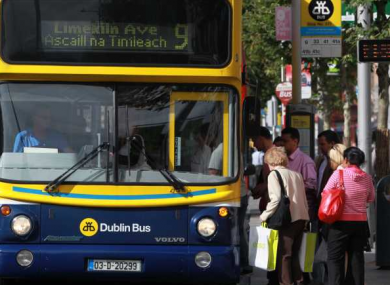 In total, Dublin Bus carried 119.5 million journeys, averaging over 328,000 a day. Luas saw the largest percentage growth – up 6.1% to 34.6 million passengers in 2015, followed by Irish Rail, which was up 5.3% to 39.8 million. Anne Graham, CEO of the National Transport Authority said the numbers were impressive and that 2016 would be another big year. “These are strong growth figures for the sector, and the operators and their staff should be proud of their achievements. Read: Are our buses and trains next for contactless debit card payments? Email “There were over 220 million public transport journeys in 2015”. Feedback on “There were over 220 million public transport journeys in 2015”.